You know how much I love recycling and turning my trash into treasure so it’s no surprise that I came up with this project after my bathroom got filled with empty boxes of soap. When Amy from Mod Podge Rocks e-mailed me and asked if I wanted to use some of the Plaid products on my future projects I knew this mini book idea would be perfect for the test run. The funny thing is that just before Amy e-mailed me, I already bought a huge bottle of Mod Podge Gloss for paper just the week before so I had a chance to try out 2 other products that got sent to me by the company: Mod Podge Hard Coat and Mod Podge Sparkle. I really, really, really loved the Mod Podge Hard Coat. I initially chose it for another project. I accidentally ruined a set of coasters I had and thought the Hard Coat formula will be perfect to restore them. However I used this as a top coat for the mini book and it is amazing. It is a bit thicker than the original formula and it dries clear into a hard coat (just as its name suggests…) that seals the cover and secure the binding of the book. I really recommend this for book makers. The Sparkle formula has fine glitter in it and it adds a fun glittery top coat to any surface. What i like about it is that it adds the glitter without the mess that usually goes with it… You just need to apply it with a foam brush and the glittery particles doesn’t rub off of it after it dries up. The recycled mini book can be made out of any box, of any size, so I purposefully left out exact measurement, so you can use the same technique on any empty box that comes your way. 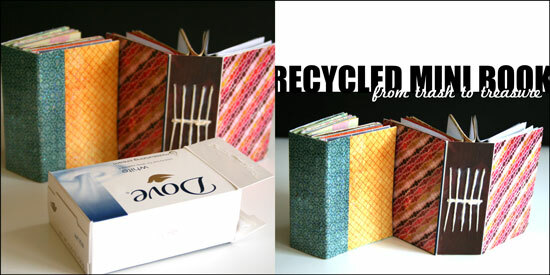 So if you feel like playing along and learn how to make this recycled mini book, keep on reading. This project uses MINIMAL supply, as it’s mostly recycled. Empty cardstock or chipboard box. Scrap of copier paper – the same width and height of the spine. Flatten the box by carefully disconnecting the connecting flaps at the bottom and inside the box. You may also use a craft knife for that. Measure the width and height of the cover sections and the spine and cut pieces of patterned paper at the same size for the cover. If you want to conceal the binding you will need one piece the size of the cover section and the other size larger by the width of the spine plus an additional inch. If you choose to conceal the binding, adhere the outer cover papers at the end. Apply a thin layer of Mod Podge to the cover section and the spine, lay the pattern paper on top of it and apply an additional layer of Mod Podge on top to seal it off. Put it aside to dry. Take a plain copier paper, the same width and height of the spine and mark 3 horizontal lines on it – one at the center and two additional ones, about an inch apart. If you work on a larger box, you may want to add more lines, equally separated from each other. Next mark equally separated vertical line, each line stands for one signature. I used 5 signatures, so I drew 5 vertical lines, one at the center and the rest in ¼” intervals. Cut your signature inserts to double the width of the cover section and the same height and fold each signature of paper inserts in half. Line up the paper guide with the inner crease of the signature and poke holes on the crease next to each of the 3 horizontal lines. these holes will help later with the binding process. After the inner cover is layered with paper with a base and top coat of Mod Podge and completely dry, line up the paper guide with the inner spine and poke a hole at each of the intersections of the horizontal lines with the vertical lines. Start binding the signatures together. Take the first one, insert the needle through the center hole and into the center hole of the signature, than to the upper hole and back from the bottom hole, into the center hole to the outer cover – repeat on all the signatures. Once you finish binding all the signatures together, weave the thread through the center line of threads until it meets the initial loose end and tie them together in a tight knot. Cut the excess thread and tidy up the knot to look as smooth and straight as possible. Lastly, apply a layer of Mod Podge Top Coat on top of the outer cover and the spine, it will secure the binding as well. You may also apply an additional layer of Sparkle Mod Podge if you want a fun glittery finish to your mini book. I have missed your videos! Glad to see you back at them … thanks for a great idea on making a book! What a cute little book! That is so creative and soaper cute! =) Thanks so much for the great how-to, I’ll be linking. 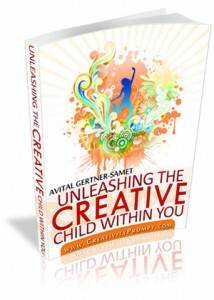 Avi, you are so wonderful – and brilliant! Just came over from Mod Podge Rocks and I love this idea!!! Great tutorial btw! Thinking of maybe using cereal boxes to make larger books instead of having to buy scrapbook albums all the time. Thanks for sharing! This is wonderful – I have bought several books on making books and signature. I too like to re-purpose things from the home. thanks! You are very welcome. I’m always excited to find new uses for otherwise trashed products. wow, this is such a lovely way of using up lots of scraps. Thanks for sharing I love how you have reused the soap box and given it a new life. This is so cool……I went and got a soap box and cut it like you said and now I’m ready to make one for myself…..thank you for sharing this super cool mini album…..I think I’m going to make some for Christmas gifts…..and I’d became a follower of yours…..don’t want to miss any more of your inspirational creations…..
What a cute little book idea! I have thrown away so many of those boxes! Thanks! The good thing about them is that they accumulate so quickly. Thanks so much. I really appreciate it! what a great idea! i can’t wait to try it and thank you for the toot! You are very welcome. Thank you for looking. What a great idea. When I have the time I am going to try this. It looks so cute. And I’m sure my pages will smell great too. I could put all my favorite pieces of scrapbook papers and cs in this little book. So many ideas. Thanks for sharing this. Thanks so much for your kind words. You are so sweet. I can’t wait to try this!!! I’m always looking for new craft ideas. Thank you so much for sharing this! I love it!! Will definitely be making some ofthese! I appreciate you taking the time to do this! God bless you! Thank you. You are MOST welcome! Thanks for sharing with us! Very cool! Now if only I can find the time!! Great video and instruction. Thanks so much for sharing. You are welcome. Thank you for watching. Thanks for the great project and very clear video– I have read instructions on this type of bookmaking before and could not really follow them, but I am eager to make a book like this. I’m glad it has been helpful and encouraging for you! Thank you for your kind words!!! Simply beautiful. Your video was excellent! I love the little books. Thanks so much for your kind words. I’m glad you liked it and found it helpful. Oh this is so grand. Thank you for inspiring all of us to do this!! I’m well on my way to completing my mini (which I will photograph and send to you if you like). My question is about how many pages to put in each signature. My mini-cereal box is 4” high and 2.75 across (doubled for the inserts, it’s 5.5). I’m using just basic construction paper. Any suggestions one how thick or how many pages I should use in each choir? Thank you soooo much! I love this idea so much!! Hi Holly! Thank you for stopping by! Second, I usually put 5 pieces in each signature. Of course it depends on the thickness of the papers, but 5 is usually ok. Just make sure that it folds nicely together with a sharp crease and the last pages don’t have a large difference in width (for making up for the enlarged crease). Thanks!! Will send the photo, though it may be some days before I can go get the Mod Podge. For now, I am just getting everything ready! Thank you again! Thanks. The Mod Podge doesn’t remain sticky after it dries out completely. If you have any worries, just use the Hard Coat Mod Podge formula as your top coat. Loved the idea and tutoral. Thanks for sharing. GREAT tutorial. Gonna make myself a real nic book…. Thanx again for sharing. Love the idea of re-using soap wrap! Thanks for sharing your tutorial! I mentioned your tutorial on my Blog and linked it back to you. SUCH a wonderful idea!!! I am sure I am going to end up with an entire stack of these lovely little books now. Thanks again!!! Thank you so much for your sweet words and for spreading the love. I really appreciate it!